The innovative powder features our exclusive blend of Glower Activators, an advanced Triple-Action Bronze Boosting Technology to create a customised tan boost that gradually builds with each application. 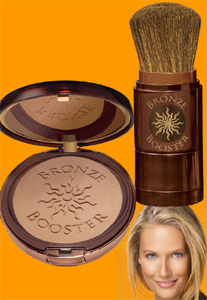 It blends and builds easily to your desired level of bronze. The mistake-proof formula is stain-free, streak-free, orange-free and odour-free. Ultra-lightweight powder formulas provide a natural-looking bronze finish. Formulated with a custom infusion of vitamins, moisturisers & antioxidants. * KapiKacchuSeeds & Phospholipids - moisturise while helping to extend the life of your tan glow. * CeratoniaSiliqua - carob tree extract works with the skin to naturally enhance a healthy-looking bronze glow. * Vitamins C & E - potent antioxidants help to improve skins clarity and radiance.